My philosophy behind good health and nutrition is to start with the basics and get to the root of any imbalances. I love being a dietitian and teaching about food and nutrition because along with good sleep and stress management, good food allows the body to heal and thrive. Cleaning carrots while wwoofing at Long Valley Farm in NC. My passions in the nutrition field are whole foods and well-being. I teach food fermentation classes in the Central Florida area, where we focus on traditional live-culture ferments like sauerkraut, tempeh, and sourdough bread. I love my full time position working toward building local food systems and supporting farm to cafeteria. I get to work with school garden initiatives of all kinds: permaculture food forests, butterfly gardens, raised beds, and more! I hope that my work can help the next generation to grow with a love for the Earth, plants and real food. 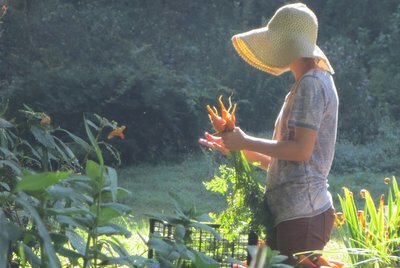 Great website and I love the picture of you WWOOF’ing! Love reading about what you are doing and if you’re ever interested, I’m always looking for guest bloggers on wellness topics on my own blog 🙂 thanks! Thanks for the encouragement! If you send me an email with a few topics, I’d be honored to have a guest post on EcoGrrl.